overnight mkt: US indices ends mixed. Oil price rally a lot. my reading of the mkt: China side started some pull back and consolidation, but US side is ok. STI is likely to make new recent high because oil price rally significantly. my reading of the mkt: mkt is still on the track of rebounding after the pull back and consolidation between 5 April to 11 April. overnight mkt: US mkt pull back from open high as concern as healthcare slump amid "regulator uncertainty"
Asian Pay TV up 43.7% within 2 trading days, will it go up some more? How to operate now? Asian Pay TV was mentioned for long at 0.134/0.135 on Monday(15 April) in the morning after which it had a very strong move to 0.194, up 43 % the next day. Congratulations to those who receive this signal and made potential profit of 43%, not in not in 2 month, not in 2 week, but the NEXT day, all attributing to the unique mkt reading skills based on Game Theory. Whether Asian Pay TV TR can go up even higher after reaching 0.194? How to operate thereafter? In terms of long term trend, it already turn to uptrend, given time, Asian Pay TV is likely to go up some more, may hit other key levels, mentioned on 16 April(click here to read my view on 16 April morning), as shown in the pic below. 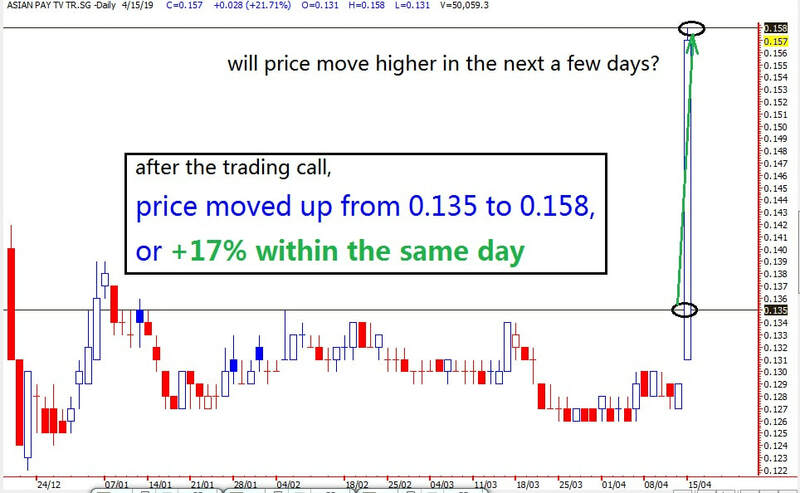 after the quick rocket-like move on 15 April, i was still bullish on Asian Pay TV for both long term and short term. I mentioned on 16 April morning BEFORE mkt opening that may consider enter gradually because Asian Pay Tv has potential to move higher. below it the screenshot of my reading of the stock and how I balance risk and potential then. For the time being, in term of short term movement, I feel it really went up a bit too fast on 15-16 April, quite overbought for short term. 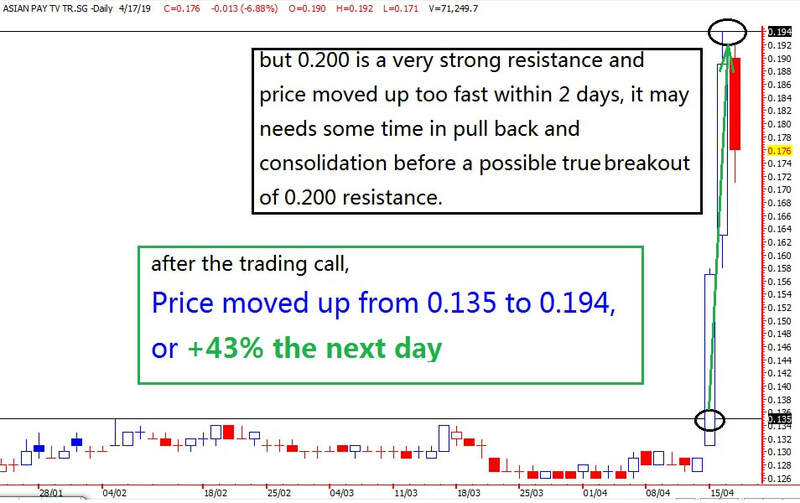 Besides, the resistance at ard 0.200 is very strong, not easy to be broken. In addition, the pull back on 17 April indicates that it already started a stage of pull back and consolidation, which may take some time. With above analysis in mind, i won't expect Asian Pay Tv to have another rocket-like move again within next a few days. It may pull back to deeper level. Therefore, i think it is NOT a good time to open new position already. On the contrary, for those who entered with good profit, it maybe a good time to unload, as least should consider to sell partial. Since the recent movement is very strong and some tech-rebound may happen now and then, may consider sell gradually whenever rebound happens. For those who want to take advantage of the long term uptrend, i think it may not be a good idea to chase above 0.180. but if price drop below 0.168, may consider gradually open some position, better start small to control risk. my reading of the mkt: Both US and China mkt started rebounding, uptrend resumed. overnight mkt: US mkt end flat, but rebounded from intraday pull back. my reading of the mkt: China side show some weakness but US side is ok. Mkt does not pull back to deep level, may need more time in consolidation but generally still bullish. Asian Pay TV has gone up 17% within the same day, will it move up further? Asian Pay TV was mentioned for long at 0.134/0.135 on Monday(15 April) in the morning after which it had a very strong move to 0.158, up 17% within the same day. Congratulations to those who receive this signal and made potential profit of 17%(can be more, given time), not in a quarter, not in a month, not even in 1 week, but WITHIN the same day, all attributing to the unique mkt reading skills based on Game Theory. Whether Asian Pay TV TR can go up even higher thereafter? How to operate thereafter? ​If we look at big chart pattern of the trust below, will find it started a downtrend since March 2018, more than 1 year ago. Since end of 2018, it almost stopped dropping and holding in consolidation zone between 0.122-0.135, the breakout of this zone may trigger further rebound or even uptrend. The strong rally ystday may totally change the trend of this trust, many traders and investors may start to take note of it for the first time since March 2018, funds may be injected into it thereafter. In addition, current market status is quite good since early 2019, the bullish mood of market participant is likely to help the trust go go some higher. Therefore, it is very likely that the trust already turned to an uptrend and may go up some more(can have pull back or even sell down in between). According to the chart, I feel the strong resistance level can be 0.150(which already hit), 0.200, 0.250,0.300, as shown in the chart below. Since it is already in an uptrend, the trust may climb to these levels given time. However, being bullish does not mean can anyhow chase. if u missed the good trading signal ystday and have not on board yet, you may need to take note of possible pull back after the rally. Besides, we will definitely see some fluctuation even if the uptrend remains successfully. so for those who have bought Asian Pay TV TR, they can either sell to take a quick and nice profit of ard 13-15% and look for other opportunities. 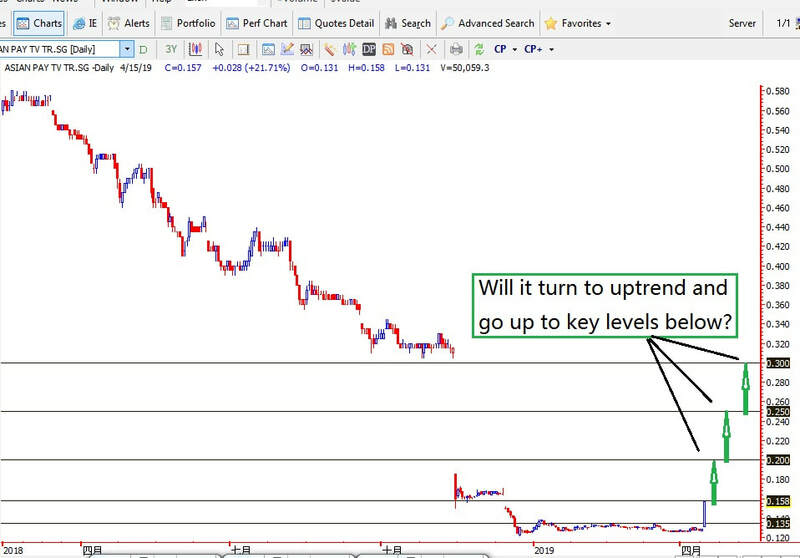 or they may consider take some risk and hold the position for mid term and expecting the price can move some further. take partial profit is also an good option to balance risk and potential profit. For those who missed yesterday nice timing and still bullish on the trust, should also take note of the risk BEFORE chasing in. I feel may enter partial by partial when pull back happens, starting with very small position first and consider increase size gradually according to price action. As this stock is very volatile now, it is impossible to prepare a trading plan in advance, has to react to price action and make trading decision on spot. Market is an arena for investors and traders. If we don't understand or apply game theory correctly, very likely we will be swallowed alive by the other side of the trade, via all kinds of market traps. 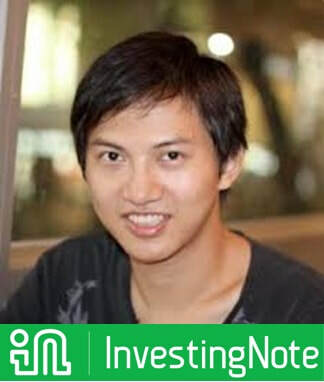 I often follow Dr. Robin Han’s trading calls and made good profit...He manage to consistently catch fast move stocks regardless the stagnant status of local market, something I’ve never seen elsewhere… His skills in stock pick and timing are of world-class level. ​The information contained in this website is provided to you for general information/circulation only and is not intended to nor will it create/induce the creation of any binding legal relations. The information or opinions provided do not constitute investment advice, a recommendation, an offer or solicitation to subscribe for, purchase or sell the investment product(s) mentioned herein. It does not have any regard to your specific investment objectives, financial situation and any of your particular needs. Accordingly, no warranty whatsoever is given and no liability whatsoever is accepted for any loss arising whether directly or indirectly as a result of any person or group of persons acting on this information. Investments are subject to investment risks including possible loss of the principal amount invested. The value of the product and the income from them may fall as well as rise. Any views, opinions, references or other statements or facts provided in this website are personal views. No liability is accepted for any direct/indirect or any other damages of any kind arising from or in connection with your reliance on the information provided herein. All the charts posted on this website are generated from POEMSVIEW.